Black cumin seed oil is the most important oil you can use in your system. It is called by many names such as black seed, Nigella Sativa, kalonji and haba al-barakah. Black seeds have been used by people to make medicine for thousands of years. So, it has been used for centuries and only during the last 40 years has the potential of realizing. Nigella Sativa is a flower native to the Middle East and Asia, and it grows to 20-30cm tall. The most common use of black seeds is in many recipes in the kitchen. The seeds are also used by many people for healing abilities. It has been confirmed that black seeds have many health and pharmacological benefits. Black cumin seeds and oil have been used for tonifying and cleansing the liver, treating diarrhea, reducing blood pressure, supporting healthy digestion, treating skin disorders, reducing fluid retention and stimulating the appetite. These seeds can be also used to reduce pain and inflammation, regulate the immune system, open the tiny air passages in the lungs and kill microorganisms. Also, they are known as a powerful antioxidant. Several studies have also shown that black cumin seeds oil is effective against tuberculosis, cancer, allergies, asthma and AIDS. One of the most important ingredients that contain the black cumin seed oil is thymoquinone. It is proven by scientists that the thymoquinone possess beneficial therapeutic potential on human health. Not only cancer, thymoquinone has an effect against problems with kidney, liver and prostate gland, too. Without side effects, it helps in the destruction of cancer cells. Diarrhea: Mix a cup of yogurt with a teaspoon of black cumin seed oil. Take this mixture twice a day. Asthma and cough relief: For cough, mix a teaspoon of black cumin seed oil into a cup of ginger tea and take this twice a day, or massage an amount of the oil over your chest. For asthma, in boiling water put one teaspoon of the oil of black seed and inhale twice a day. Colds and flu: Take a teaspoon of black cumin seed oil once a day with plenty of fluids. This works for controlling the high blood pressure also. Toothaches: To reduce the pain, rub a small amount of the oil on the tooth and affected gum. Repeat this for 15 seconds. You can also use a glass of water mixed with a half teaspoon of black seed oil as a mouth wash. Allergies: Take a teaspoon of oil twice a day to reduce the symptoms of allergies like sneezing. Diabetes: Take a cup of black seeds, a cup of mustard seeds, and half a cup of fumitory and half a cup of pomegranate peel. 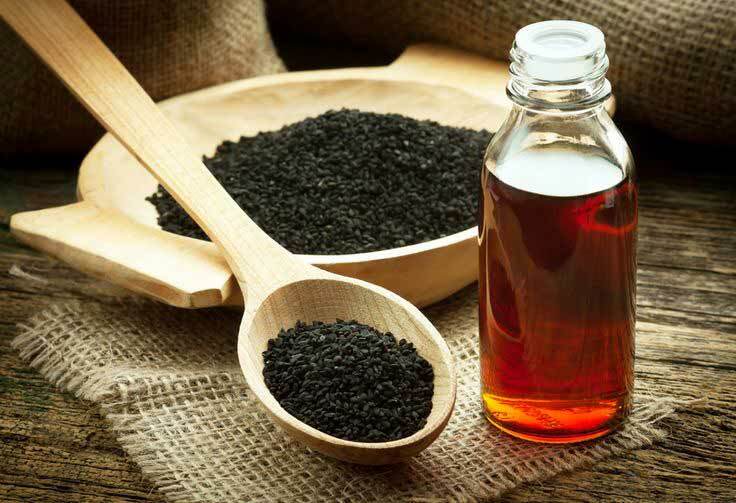 Take a half a teaspoon and a teaspoon of black seed oil every day before breakfast. Headaches: With a small amount of black cumin seed oil massage the forehead and the sides of the face near the ears; also take a teaspoon of the oil before breakfast. Muscular pains: With a small amount of black seed oil massage the area of the pain. Hair loss: Mix a teaspoon of black seed oil in tea or coffee and drink it. Than massage the scalp with black seed oil. Arthritis and Backache: Massage black seed oil into the affected joints deeply. Take a teaspoon of black seed oil daily. Tiredness: Consume a mix of black seed oil with a glass of pure orange juice every morning before breakfast. Insomnia: Consume one table spoon of black seed oil mixed with honey every evening. Cardiovascular: Drink a mix of half a tsp of the black cumin seed oil with warm water before breakfast. Eye disease: Because carrots make the eye sight better, mix a cup of it with half a teaspoon of the black seed oil and drink.